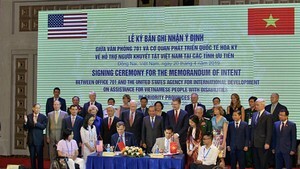 At a conference in Hanoi on January 4, Deputy Prime Minister Nguyen Xuan Phuc said the main task of the Government Inspectorate in 2013 should be to target key areas like finance, budget, banking, public asset management, import and export, stock and gold markets. According to a report presented at the meeting by Government Inspectorate officials, in the year 2013, the Inspectorate plans to conduct major inspections in the mining and processing industries controlled by the Natural Resources and Environment Ministry, and contemporary imports for re-export under the control of the Industry and Trade Ministry. Last year, inspectors conducted nearly 9,700 administrative inspections and examined more than 520,000 units and individuals. As a result, they recommended reclaim of nearly VND30 trillion (US$1.44 billion) for the State Budget and more than 1,530ha of land. They also recommended fines of VND13 trillion ($6.24 million). More than 1,033 groups and 2,212 individuals were found to have broken the law, with 104 found involved in corruption. However, Government Inspectorate also reported that in 2012, inspection efficiency was not high, and the inspection process, the complaints and denunciations were still low, and the results of a number of anti-corruption cases were not plausible. 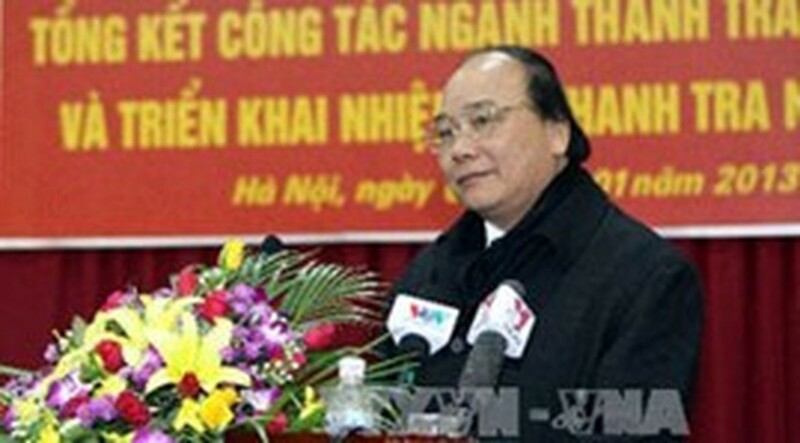 Speaking at the conference, Deputy Prime Minister Phuc pointed out weaknesses that the inspections should overcome. He requested the Inspectorate to heighten responsibility, and increase dialogue and conciliation when settling pending cases. Besides, the Inspectorate should crack down on violations in key sectors like finance, banking, management of State Budget funds and the import and export industry. He asked relevant ministries, agencies and localities to support inspectors in fulfilling their duties, monitor and protect their material and spiritual lives, and provide high-performing inspectors with timely rewards. He ordered that no one, especially high ranking officials should be allowed to intervene in the work of inspectors. The Deputy PM also asked inspectors to handle complaints from the public much more quickly and to take drastic measures to solve 528 cases pending from last year. He said ministries, sectors and local authorities also needed to co-operate better with inspectors in addressing citizens' complaints.